We’d like to thank Dujuan Thomas for sharing this story. My ROTC group was in Charleston, SC for a trip. We went to the RiverDogs game and after a while I decided to wander around. 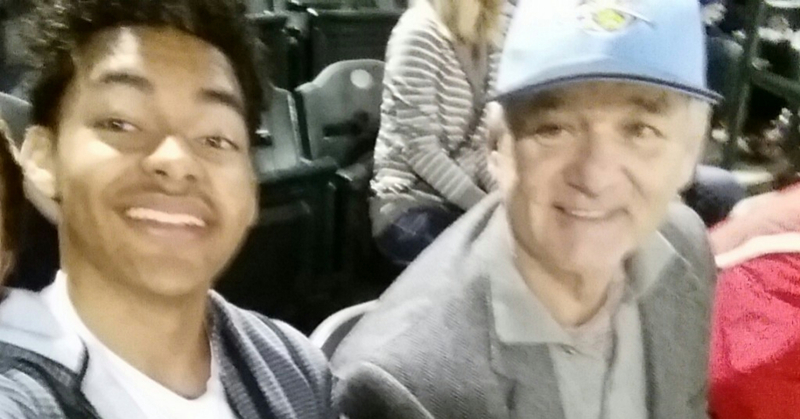 I was about to take a panoramic picture of the stadium when someone said Bill Murray had just walked by. I told my friend and we went off to find him. So I sat and we conversed about stuff. I told him where I was from and he said, “Oh I know Paducah” and went on to sing a song from the 40’s – “Paducah, Paducah, you can rhyme it with bazooka if ya’ wanna. But don’t boo boo Paducah, its another word for paradiiiiise!” So that was cool. wonderful BM story, well written too, so enjoyed it; thanks for sharing! I enjoyed this story, as well. Nicely done! I thought Bill might be joking about this being an actual song. Sounds like something he made up. To those that want to hear the original Paducah song: https://www.youtube.com/watch?v=TMpJA0iv8Q8 Singing starts around 1:34 It’s Benny Goodman and Carmen Miranda from the movie The Gang’s All Here. Bill Murray is my favorite actor of all time, that’s on my bucket list to meet him.